It turns out that as the American people find out what’s in the bill, they actually don’t seem to like it one bit. That dissatisfaction found expression this week not just in the court of public opinion, but also the court of law. Remind us to never let Harry Reid or Nancy Pelosi pick our lottery numbers. Of course, we already learned everything we needed to know about Harry Reid’s fortunetelling prowess when he announced in May 2007 that “this war is lost,” just as the American military was commencing its successful Iraq surge. Regardless, it turns out that as the American people find out what’s in the bill, they actually don’t seem to like it one bit. That dissatisfaction found expression this week not just in the court of public opinion, but also the court of law. The bill to which we refer, of course, is ObamaCare. Judge Hudson struck the appropriate note, since the legal challenge against ObamaCare centers on the momentous issue he referenced. Namely, does any constitutional restraint upon the federal government’s power survive today? The Constitution as written grants the specific federal power to “regulate Commerce with foreign Nations, and among the several States.” Can that authority to regulate interstate commerce be read so broadly as to compel involuntary commercial activity by individual citizens via purchase of bureaucratically approved insurance policies? If so, then no effective limit upon federal power remains. Such a result would surely startle our Founding Fathers, who sought to protect individual freedom by creating a government of limited powers. They’re certainly not laughing now. Thus, the White House has gone from snickering at constitutional challenges to labeling them implicitly racist. 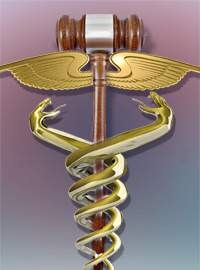 In the court of public opinion this week, ObamaCare received an equally resounding rejection. Missouri is known as “The Show Me State,” and its politics are as famously centrist as its geography. In the 2008 presidential election, for example, the difference separating Barack Obama and John McCain was a mere 0.1%. Missouri voters are anything but equivocal toward ObamaCare, however. When asked to register their opinion on the same individual mandate question addressed by Judge Hudson, a 71.1% majority approved Proposition C, which prohibits forcing individuals to purchase insurance coverage. People of reasonable minds can differ on the wisdom of foregoing health insurance, but Missouri voted more than 2-to-1 against forcing free citizens to engage in commercial transactions as required by ObamaCare. With an open Senate seat to be filled by Missouri voters this November, we presume that the White House will be more circumspect in labeling that state’s electorate racist. Then again, this is the same Obama who childishly contested whether ObamaCare’s individual mandate constituted a “tax,” only to turn around and defend it in court under federal taxation power. As electoral and judicial defeats accumulate, anything is possible.